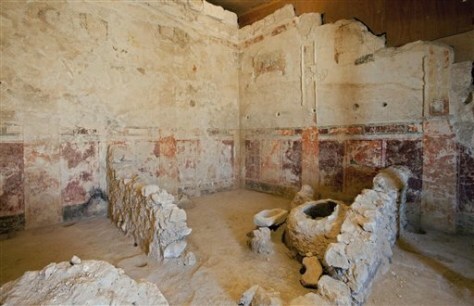 Frescos discovered in the Herodium complex, in the West Bank, south of Jerusalem, Sept. 21, 2010. Israeli archaeologists have excavated a lavish private box in a 400-seat theater located at King Herod's winter palace in the Judean desert. Head archaeologist Ehud Netzer says Herod commissioned Roman artists to decorate the theater walls with elaborate paintings and plaster moldings around 15 B.C.